As promised here is my step by step of the altered book I made to create my vintage visual journal for the rest of this year (and beyond?) 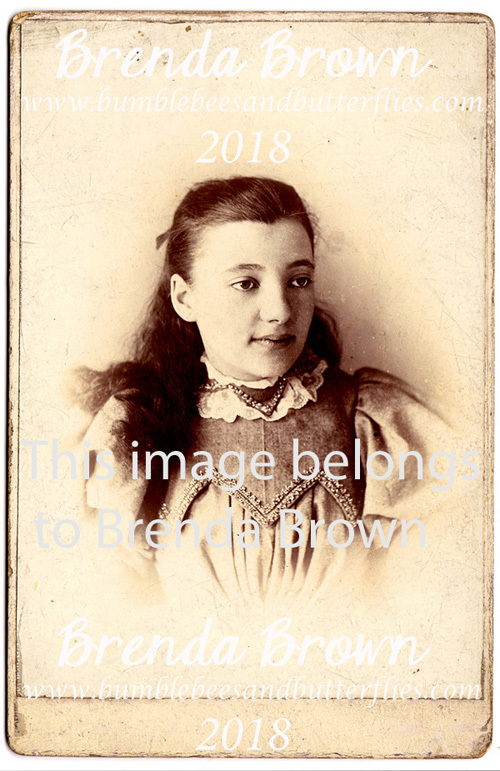 using one of my treasured cabinet cards. To see the full challenge brief pop over to the AVJ Challenge Blog where you can read all about the challenge and see the amazing inspiration projects from the Creative Guides. You can also see my introduction post HERE. 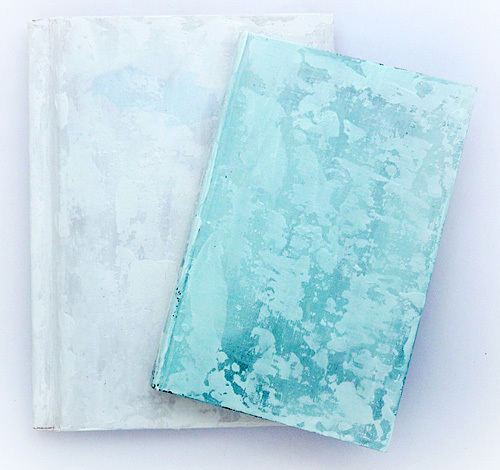 I began by preparing a couple of old books by painting the outside covers with gesso and adding some texture using the gesso with a palette knife when it was dry. ..... I decided that as it was quite plain I would alter it and I found a piece of old Graphic 45 paper and cut an oval shape from it. I had ensured there was plenty of space around the oval to fully cover the card. I aged the centre cut by rubbing round with an emery board and blending over ground espresso DI. 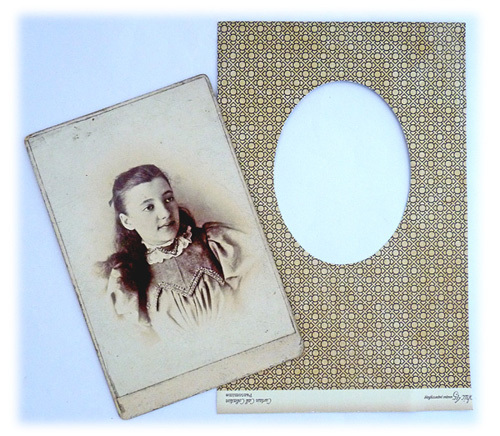 Then I adhered it onto the cabinet card and used a sanding block to sand away the excess patterned paper. This had then distressed the edges as well and again I blended in ground espresso DI. 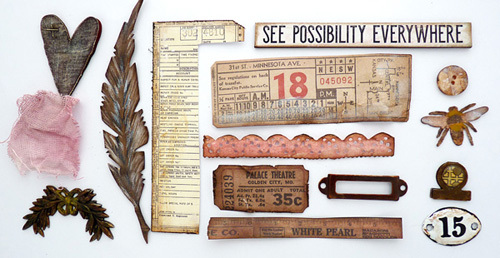 I started to gather bits and snippets to make some decisions on the embellishing first. 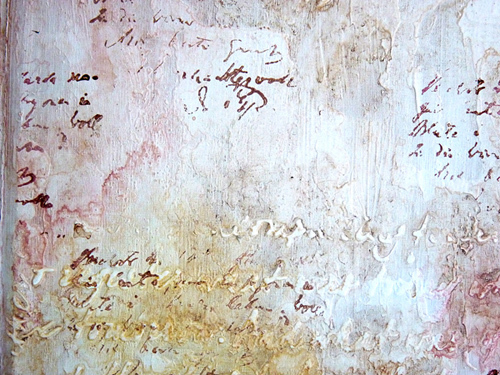 Every piece has been painted, inked and/or distressed in some way. I sealed all the card embellishments with satin varnish before they were added to the cover. 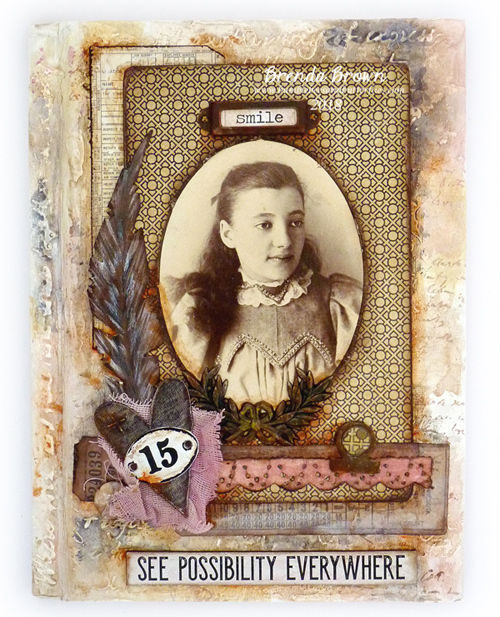 This cabinet card covers quite a bit of the front cover so I felt I needed to create a layered background with textures and neutral covers. 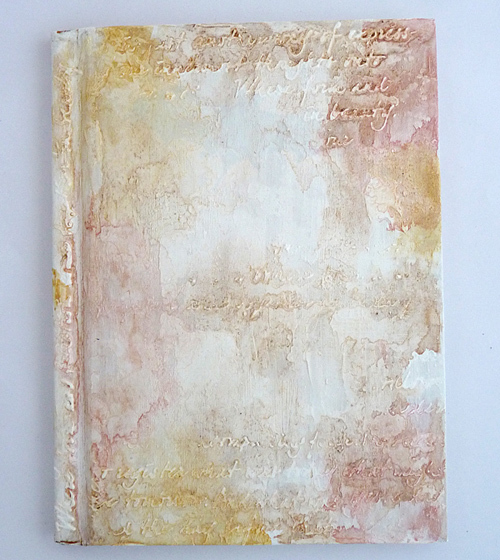 I began with a text stencil and texture paste mixed with gesso that I heat dried and then, dribbled, dipped and spritzed my gorgeous decoart media acrylics. Using quinacridone magenta, titan buff and yellow oxide I dribbled and spritzed the colours to create a light mottled background. 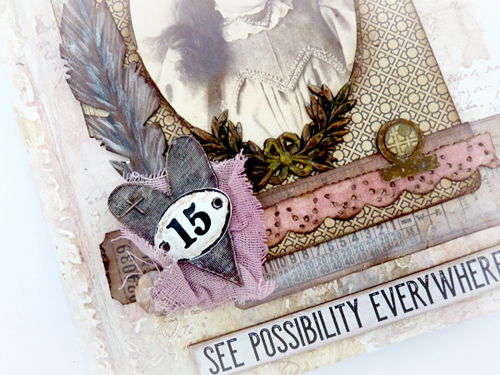 I stamped with the same colours using a text stamp from the Andy Skinner shabby chic set. I darkened the background by dribbling and spritzing some raw umber with titan buff and dabbled over some watery titanium white (all the time I am heat drying between each layer). At this point I decided to seal it and used the DecoArt satin varnish. 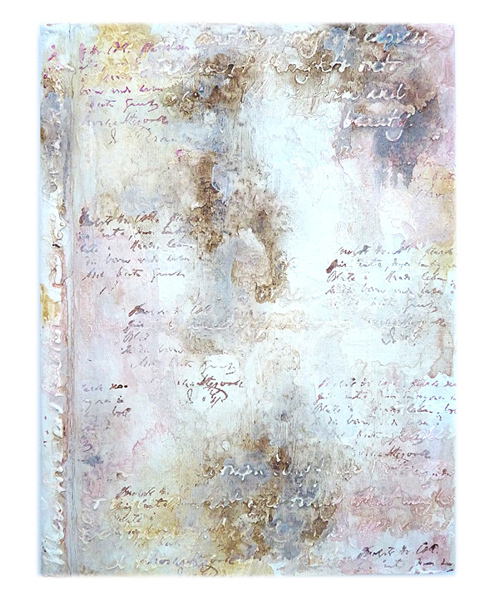 I wanted it to be very sturdy and ready to take the punishment of it being used regularly and creating and making the new journal pages. 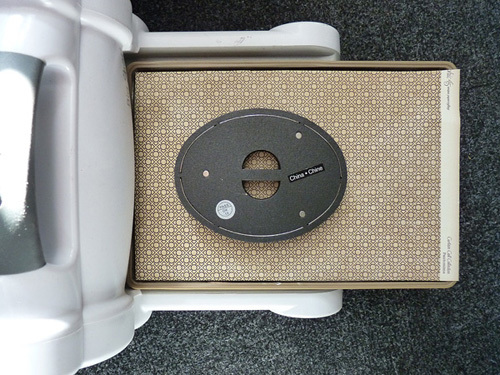 I began adding the collage elements in layers ....... getting the base parts adhered and flattened under a heavy box. Now to add in the collage elements. I used the new clear modeling paste from DecoArt and oh boy does it have a strong bond for the card, fabric and metal pieces. Looking at the book I felt there was something missing - contrast in the background - so I took a fine brush some quinacridone gold, paynes grey and raw umber ........ and with some dabbling of the colours around the collage elements the shading, shadowing, aging and framing has brought it together more. I have already created my first pages in the book so keep an eye on my blog - Bumblebees and Butterflies - in May when the project will go live. Thanks for stopping by, we hope you are enjoying the new schedule and don't forget next Friday will be the start of our Creative Cardmaking series. I know the lovely Julia will be kicking us off with a fabulous make, so make it a date to be back here in a weeks time. See you then. 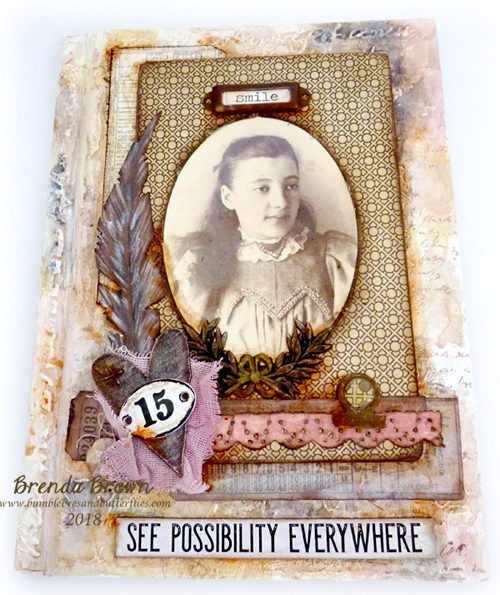 Brenda, this is a fabulous post filled with so great tips and techniques! That shading at the end was a genius move which really brings authenticity to those lovely vintage elements. Your journal is a brilliant design, and everything works perfectly together. thank you for sharing! Hugs! 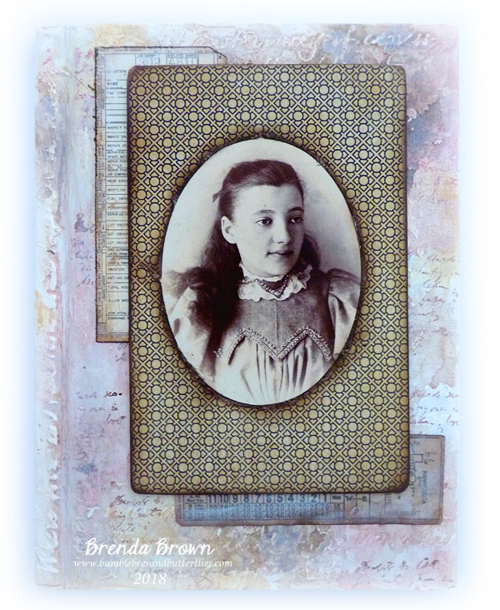 Wonderful journal cover Brenda, - you always work magic with those paints, that dribbled background looks amazing and the collage elements around that wonderful photo look fantastic! A great tutorial, thank! This is absolutely enchanting - it is certainly an intriguing cover that pulls you to open it and explore further within the book! Thanks for all the tutorial tips - especially the distressing colors at the end - they are not what I would have tried, and yet they are absolutely perfect and work so well. I appreciate the information and thank you for sharing it. Really, just a delightful composition. What a beautiful journal! Thank you for the detailed tutorial, you make it look so easy! I love what youve done with old book and that card is so nostalgic too. 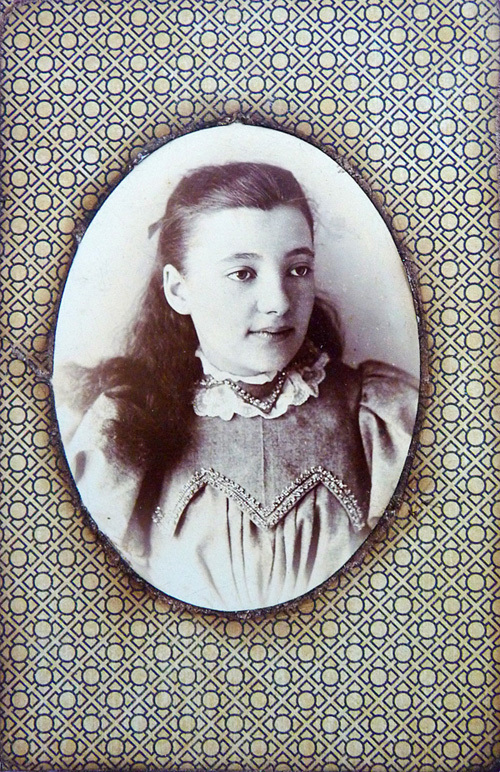 I collect Edwardian postcards so i love anything like that. p.s. I deleted the previous comment as it showed my old blog which i no longer use. Love this project. Thanks for the awesome tutorial. It's our 4th Birthday - come celebrate.